Probably the neatest part of this treasure hunting hobby is the self induced education you receive. Young people are very curious about what they find. I think the most frequent question is "How did it get there?" Of course that spawns other questions like: "How long has it been buried", "Who could have lost it", and on and on. It´s terrific to see the look of awe on the face of new hunters of any age, when they pull out that first piece of treasure. Research, research, research. When is the last time you spent 2, or 3 hours in the library? How often have you discovered places with names that don´t match, old amusement park sites, abandoned homesites, beach areas, etc.? A spot like "Keystone crossing", where there is no evidence of rail tracks, and only a single street lies next to it, is an example. Was there a train track in day´s past? Was there a station there? Research! Some of the nicest finds are found in the shallow water of a beach. Old encampments on the shore of a lake or river. Think about where you would set up a base camp, if you were moving through a wilderness. Many pieces of jewelry are recovered from beaches. People are always on the move, many times their trail is buried behind them. An excellent source of possible sites are old "class" books. I have found some excellent information in high school class books. 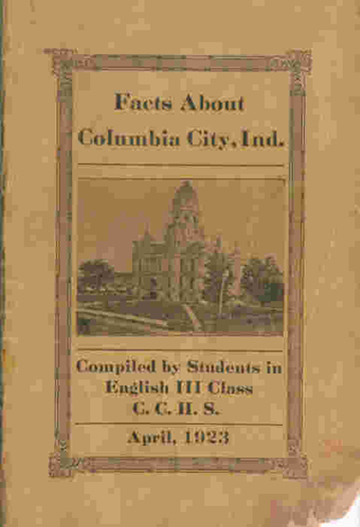 Pre 1930 high school almanacs seemed to detail much about a local area. Local business, theaters, maps, and points of interested were all detailed. If you are a student, convince your teacher of the value of recording the history you are making today. By looking through the above 24 page book, I´ve found Indian Head pennys, wheat cents, a .38 caliber rimfire bullet, hair barettes, and other memorabilia. Another great source of information of where you might detect some treasure, is your parents or grandparents. If you have some elderly relatives, find out where they played when they were kids. You just might be surprised at the information that never gets written down, or passed along. Where I live, the Pennsylvania railroad at one time had a freight station at the end of my property. No one had ever recorded that information locally. While on a trip several years ago to Strausburg, PA. I stopped in the Pennsylvania Railroad Museum. I discovered the existance of this “prehistoric” station. Without getting many feathers ruffled (it’s an old geezer term), anything can be “prehistoric” if no one is aware of the event or fact. So sometimes it’s a great idea to ask your relatives about the past. Besides, grandpa’s are always ready to talk about it, and grandma’s can put a few cookies on the table while the discussion is going on. If you find something, show them! What a fantastic way to expand your knowledge of history, get away from the TV, and get in touch with our past.